But what to do for a few extra bucks. While discussing ideas to procure a little walking around money, our cell block Einsteins determined that burglarizing the Dollar General store less than a mile down the road would be the ticket to some fast, easy cash, especially if they marketed their loot properly for maximum markup. Apparent members of the local Mensa Marketing Club, they agreed that the best opportunity for maximum profit margin was to target their very own “captive” market, where cigarettes are known to bring a small fortune, so valuable that they are sold individually, not in packs. So, they broke out of prison, schlepped down the road to the Dollar General, loaded up with all the loot they could carry, then broke back into prison to begin Phase 2 of their ingenius sales and marketing plan, and would be living high on the prison hog right now if not for the Dollar General’s surveillance cameras. Who knew a Dollar General would have surveillance cameras? A bizarre crime happened in Holmes County Tuesday when four inmates reportedly broke out of the Holmes-Humphreys County Correctional Facility, burglarizing a business, then sneaking back in to jail. 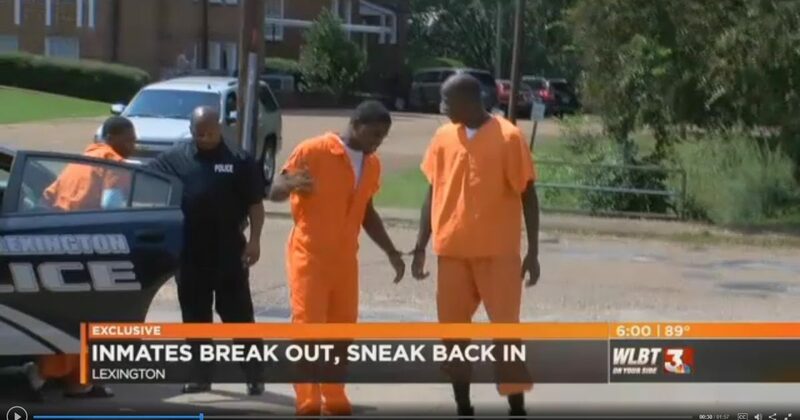 The inmates, Levontaye Ellington, Travis Baker, Maurice Robertson and Jacquiez Williams escaped their cell, jumped the fence of the jail and walked less than a mile to a Dollar General. Police say surveillance video from that night shows they broke in after hours to steal any and everything they could get their hands on. “They stole cigarettes, cigarette lighters, phones and just items they felt they could sell in jail,” said Lexington Police Chief Robert Kirklin. After grabbing the items in the store, the chief says instead of making a run for it, the men snuck back into jail unnoticed. Williams even bonded out for another charge before authorities figured out what happened. The inmates denied being involved in the break-in as they walked to their initial appearance at the Lexington Police station Tuesday. The chief says the surveillance video tells a different story. In fact, he says the footage was key in helping identify the thieves. “Just looking at the type of clothing they had on and just one of the bags they had put some of the merchandise in,” added Chief Kirklin. Holmes County Sheriff Willie March confirmed the escape happened and said his team is now working to better secure the facility and beef up security to make sure this doesn’t happen again. Some of the items stolen were recovered and the four inmates are all being charged with commercial burglary.